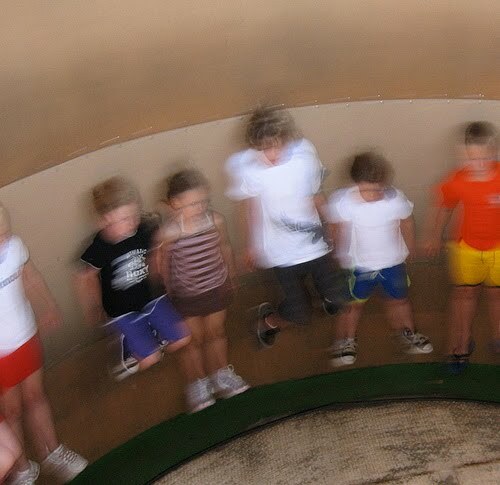 There is an amusement park near my home that has one of those lose your lunch inducing rides that spin faster and faster until the floor drops out. It leaves you stuck to the wall until the ride slows and you gradually resume your footing on solid ground. The science of this phenomenon is centrifugal inertial force. My university is welcoming 4,356 new students to campus as we begin the fall semester; colleges across the country are welcoming thousands more over the next few weeks. Imagine the inertial force as these students navigate classes, new roommates, and campus cultures that are frequently in contrast to their personal experiences. Now, imagine your campus as a giant spinning disk with a student planted firmly in place by centripetal force, moving along the curved path of the disk, going with the flow. All is fine as the student survives residence move-in, deciphers a schedule, and maneuvers the dining center. But soon the campus disk is spinning faster and the centrifugal inertial force can become greater than the centripetal friction force holding the student in place. A failing quiz grade, roommate argument, financial difficulties or homesickness can all be triggers to send our students flying right off the college ride. As we in student affairs greet our new students and those who are returning, it is important that we keep these laws of physics in mind. Know what resources you have available to address student concerns. Advocate for your students when university networks are difficult to follow. Listen carefully for clues that a student may be struggling. Understanding F = mv2/r may just save a student. This entry was posted in college freshmen, critical thinking, first-year experience, higher education, Orientation, perseverance, residence life, sachat, student affairs. Bookmark the permalink. ← Worth the Price of Admission?